Posted on May.22, 2015 by admin Bookmark the Permalink. Vic Firth Corpsmaster MB0H Marching Bass Mallets are designed for 14" - 18" bass drums. They feature super hard spherical felt heads to provide a consistent striking surface. Tapered hickory shafts shift the weight of the stick towards the hand for improved balance and control. Field tested and field proven throughout years of collaboration with the world's finest drum and bugle corps. Head Size = 1 1/4" x 1" Length = 14 1/8"
Vic Firth Corpsmaster MB5H Marching Bass Mallets are designed for 30" - 32" bass drums. They feature super hard spherical felt heads to provide a consistent striking surface. Tapered hickory shafts shift the weight of the stick towards the hand for improved balance and control. Field tested and field proven throughout years of collaboration with the world's finest drum and bugle corps. Head size = 2 1/2" x 1 3/4" Length = 14 1/8"
Vic Firth Corpsmaster MB3S Marching Bass Mallets are designed for 26″ – 28″ bass drums. They feature soft felt cores and fleece covered spherical felt heads to provide a consistent striking surface. Tapered hickory shafts shift the weight of the stick towards the hand for improved balance and control. 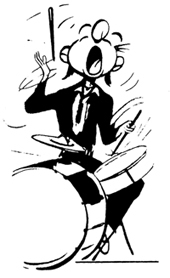 Field tested and field proven with the world’s finest drum and bugle corps. 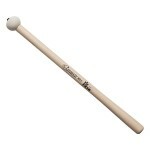 Head size = 2" x 1 1/2" Length = 14 1/8"
Vic Firth Corpsmaster MB1S Marching Bass Mallets are designed for 18″ – 22″ bass drums. They feature soft felt cores and fleece covered spherical felt heads to provide a consistent striking surface. Tapered hickory shafts shift the weight of the stick towards the hand for improved balance and control. Field tested and field proven with the world’s finest drum and bugle corps. Head size = 1 1/2" x 1 3/16" Length = 14 1/8"
Vic Firth Corpsmaster MB4S Marching Bass Mallets are designed for 28″ – 30″ bass drums. They feature soft felt cores and fleece covered spherical felt heads to provide a consistent striking surface. Tapered hickory shafts shift the weight of the stick towards the hand for improved balance and control. Field tested and field proven with the world’s finest drum and bugle corps. Head size = 2 1/4" x 1 3/4" Length = 14 1/8"
Vic Firth Corpsmaster MB2S Marching Bass Mallets are designed for 22″ – 26″ bass drums. They feature soft felt cores and fleece covered spherical felt heads to provide a consistent striking surface. Tapered hickory shafts shift the weight of the stick towards the hand for improved balance and control. Field tested and field proven with the world’s finest drum and bugle corps. Head size = 1 3/4" x 1 5/16" Length = 14 1/8"
Vic Firth Corpsmaster MB4H Marching Bass Mallets are designed for 28" - 30" bass drums. They feature super hard spherical felt heads to provide a consistent striking surface. Tapered hickory shafts shift the weight of the stick towards the hand for improved balance and control. Field tested and field proven throughout years of collaboration with the world's finest drum and bugle corps. 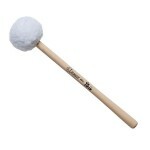 Head Size = 2 1/4" x 1 3/4" Length = 14 1/8"
Vic Firth Corpsmaster MB3H Marching Bass Mallets are designed for 26" - 28" bass drums. They feature super hard spherical felt heads to provide a consistent striking surface. Tapered hickory shafts shift the weight of the stick towards the hand for improved balance and control. Field tested and field proven throughout years of collaboration with the world's finest drum and bugle corps. Head Size = 2" x 1 1/4" Length = 14 1/8"
Vic Firth Corpsmaster MB2H Marching Bass Mallets are designed for 22" - 26" bass drums. They feature super hard spherical felt heads to provide a consistent striking surface. Tapered hickory shafts shift the weight of the stick towards the hand for improved balance and control. Field tested and field proven throughout years of collaboration with the world's finest drum and bugle corps. Head Size = 1 3/4" x 1 5/16" Length = 14 1/8"
Vic Firth Corpsmaster MB1H Marching Bass Mallets are designed for 18" - 22" bass drums. They feature super hard spherical felt heads to provide a consistent striking surface. Tapered hickory shafts shift the weight of the stick towards the hand for improved balance and control. Field tested and field proven throughout years of collaboration with the world's finest drum and bugle corps. Head Size = 1 1/2" x 1 3/16" Length = 14 1/8"